San Francisco-born, New York-based post-punk band The Rapture have been in the music business for over a decade now and it really shows! 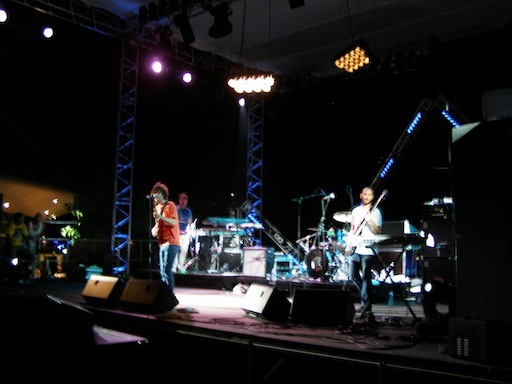 Luke Jenner, Vito Roccoforte and Gabriel Andruzzi (who replaced Matt Safer on bass guitar in July 2009) know how to galvanize the crowds and get the party started. Starting their hour-long set with three of their most contagious hits (“Don Go Do It”, “Pieces Of The People We Love” and “Get Myself Into It”), The Rapture were coming on strong! The rest of the performance was handled with brio by the three musicians. Their blend of post-punk, dance, disco, electronica and indie rock turned out to be as effective live as it is on their last album to date Pieces Of The People We Know (Universal Motown Records, 2006). – When will your new album be released? – How has your sound evolved? Can you describe it in a few words? – Do you all sing on this album? No! No it’s just me (Luke)… There’s a lot of vocals on this album. Each song either has a lot of vocals on it or a lot of keyboards. – How has Europe been treating you so far? Do you find it harder to relate to audiences here? We’ve been coming to Europe for the past 8 years. It’s kinda normal to come to Europe for us. And it’s different from the US, but also France is incredibly different to play from the UK or Germany. It’s really more of a city to city thing… and can be even city to city and venue to venue. Some venues people just feel better and make us feel better and some are harder venues to play… It can even be day to day. I mean if you learn anything from being in a band it’s that you really can’t expect anything: a lot of times the best shows that you had, you will go back to that same audience and something will be really off. It’s like you can’t ever control what’s gonna happen and that’s kind of the most beautiful part… Tonight could be the best show we’ve ever played or the worst show we’ve ever played. – Will you play any new songs tonight? – When you’re at a festival do you get to hang out with other bands? It depends on the festival. I mean I think we do that more now. We used to be a little more standoffish before but we’ve grown up.. That’s an enjoyable thing actually. I really like to meet the other bands and just hang out. Sometimes it can be hard cause you’re busy, especially if you’re not staying for long. But if you’re somewhere for a few days or if you’re touring the whole summer, you’ll see the same people over and over again. You get to know the people. – Is there some kind of competition between bands? Like who’s gonna get the best audience response? Who’s gonna drive the crowds wild? I think a lot of bands do that but we don’t… We’d rather sabotage the other bands (laugh). I mean instead of relying on our own strengths… No, I mean we don’t really compete… It’s not about winners and losers. It’s music!